You find this option beside each tab name under the main People tab on the Organization page. This update feature is used when you want to make a change to more than one person at a time. The only tab without this feature is the Previous member tab. Filter for the group you want to update, then click the Update link in the appropriate dropdown. For Members, the link is Update Members; for Guests, it is Update Guests; and so on. You can update members individually by using the Member Dialog after clicking their Member Type. You can drop all Members or a few at a time. You can even drop using a Tag. An Organization Member’s Enrollment Date is set automatically, and will be the date when they actually enrolled. However, there are times when you may want to change that date. You created an Organization and enrolled people after the Members have been attending for a while. You will want to create those past Meetings and record their attendance. In order to do that, you need to make their Enrollment Date be a date prior to the first Meeting for which you want to record their attendance. Go to the Organization > Members tab and click the Update Members in the dropdown beside Members. Select the new enrollment date using the date picker. Click Update , and then OK at the prompt. Click Close to close the dialog box. Now you can create the Meetings for any date after the new Enrollment Date and the Members will display. If you only want to update a few people, and not everyone in the organization, check those you want to update, click Filter , and then click Update Members. The default Member Type in an Organization will be Member. You can change one person’s Member Type by clicking on their Member Type and using the Member Dialog Box. However, if you want to change Member Types for multiple Members, you can use the Update Members button. You have just enlisted new Group Leaders in an Organization and you need to change the Member Types for each of the new Group Leaders, as well as changing any former Group Leaders back to Members. Go to the Organization > Members tab and check the box beside those to update and press Filter . Now select Update Members from the Member tab dropdown. Select the new Member Type from the drop-down menu beside Membertype . If you are making corrections for a Member Type that should have been made previously, or are if you are recreating history for this organization, you can not only change the member type, but you can also set it as the original member type (so that regardless of the date you make the change, it will be as though they had that Member Type effective on their enrollment date). Just check MakeMemberTypesOriginal at the time you change their Member Type. This is important if you are making the person a Leader type of Member or a VIP. By checking this box, their attendance will get recorded correctly even when you are creating meetings in the past. There are a couple of specific use cases for assigning an Inactive Date to current members. Most church has their deacons serve by terms - either 2 or 3 years. They are Active Members for those years, then, instead of being dropped, they are moved to the Inactive tab of the deacon Organization. Committee members also normally serve for a specified term. For those, instead of making them Inactive at the end of their term, you just drop them. In each of these use cases, having the date their term ends is very helpful. We suggest assigning an Inactive Date when they are enrolled or when they go back on as Active. If you do that, it will serve as a reminder for when you should change them from an Active Member to an Inactive Member, or when to drop them from that organization. You will want to use a standard date for everyone, even if the year is different. For example: All deacons go Inactive on Dec. 31 of the 2nd year of their term. Or all committee members are dropped on March 31st the year their term expires. This is best done as soon as you enroll someone that will serve a specific term. Go to the Organization > Members tab and click the Date drop down and select sort by Join Date . This will put all those recently enrolled at the top of the list. Check the box beside each one who will have the same Inactive Date , and press Filter . Using the Members tab dropdown, select Update Members . Now select the future date (using the Inactive Date calendar) that these members will either go inactive or be dropped. Click Update , and then OK at the prompt. Then click Close to close the dialog box. This will not automatically move them to the Inactive tab or Drop them. You will do that using the Inactive Date as a reference. Use the Drop Member process if you do not want the person moved to the Inactive tab. You can use Steps 1 & 2 below in order to filter for those to drop. Go to the Organization > Members tab and click the Date drop down and select sort by Inactive Date . This will put all those with the same Inactive Date together in the list. Check the box beside each one that should go Inactive, and press Filter . Now select the Member Type Inactive . If you do not want to retain their Inactive Date, check the box to remove it. For the use cases described above for deacons and committee members, you might take advantage of enrolling them as Pending Members during their approval process. Then, once you are ready for them to begin serving, move them from Pending to Members. Using the drop down on the Pending tab, select Update Pending . Remove the check beside Pending , and select an Enrollment Date if it should be different the current one. Ex. A term begins on April 1, and you are moving them on March 28. Set the Enrollment Date to April 1. If you ave not moving all Pending Members to Members, be sure to filter first. You would only use Update Members to add a Transaction when making a Fee Adjustment that applies that same adjustment to everyone. For example: the air fare for your mission trip was reduced, or the hotel rates were increased. If you need to make an adjustment for several members, but not everyone, use the checkboxes to filter the list first. Using the drop down on the Members tab, select Update Pending . Select the green Transaction button, and then Make Fee Adjustment . Enter the amount of the adjustment. If the balance needs to be increased, use a negative number (-50). If the balance needs to be decreased, use a positive number (50). Enter a description, which explains why you are making the adjustment. You can either manage your sub-groups using Sub-Group Management from the Blue Toolbar > Gear or you can perform some sub-group management right on the Members tab, using Update Members . Both of these require the user role Manage Groups . 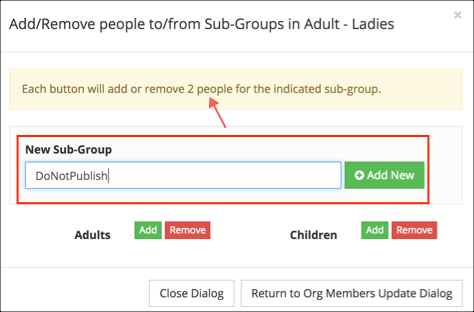 A user with Edit role can add new and manage existing Sub-Groups for one member at a time using the Member Dialog. To manage multiple members using either Sub-Group Management or Update Members, a user must have the role Manage Groups. When you add a new sub-group using this method, it will not only create the group, but will also add everyone in your filtered list to that group. Filter for those to be added to the new group, and then select Update Members from the Member tab. Enter the name of the new group in the field labeled New Sub-Group and press the green Add New button. This will add everyone in your filtered list to this new sub-group. When you use the Add or Remove button beside a sub-group in the Update Members dialog, everyone in your filtered list will be acted on. Filter for those to be added or removed from an existing group, and then select Update Members from the Member tab. Find the correct sub-group in the list and click either Add or Remove . When finished click Close Dialog . If you Remove everyone from a sub-group, so that no one is still in the group, that group will be deleted.